Q1) a) What are the applications of Parallel Computing? Q1)b) Explain Granuality,Concurrency and Dependency Graph. ii) The nodes in the task-dependency graph represent tasks whereas edges between any two nodes represent dependency between them. For example, there is an edge exists between two nodes T1 and T2, if T2 must be executed after T1. Q2) a) What are the Principles of Message Passing Programming? iii) The sequential programming based on the machine in which multiple programs can be allowed to execute by the time-sharing facility provided under the multitasking operating system. 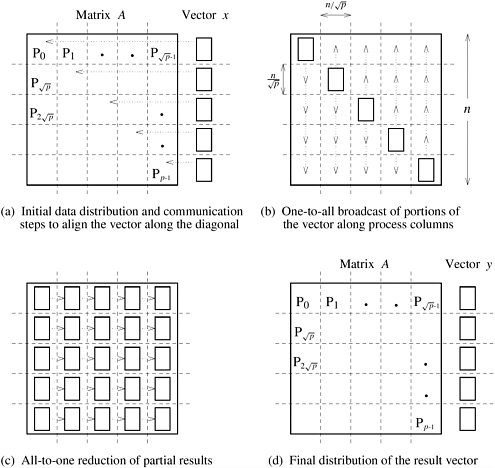 i) The fig shows the logical view of the machine for message-passing paradigm. 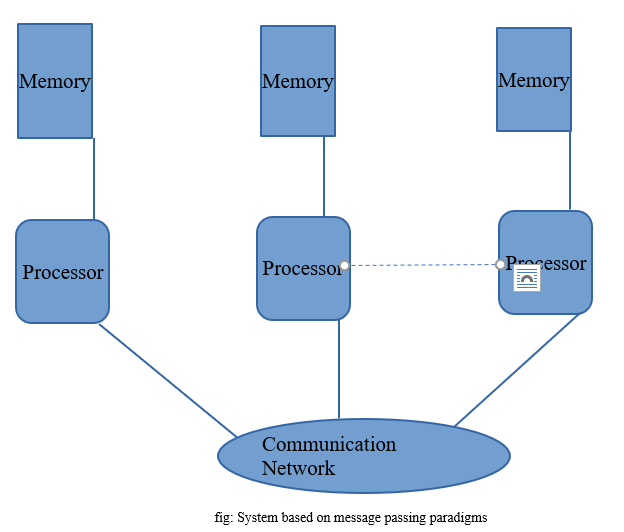 ii) The message-passing system does not support sharing of memory by the processors included in the system. This means processors are not allowed to access each other’s memory directly. 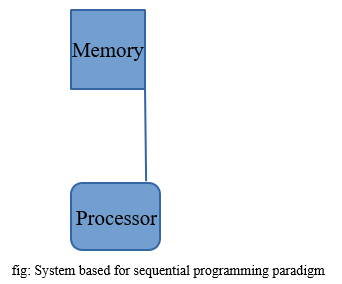 iii) The different types of architectures included for the message passing paradigm included for a single processor systems to distributed or shared-memory multiprocessor systems. 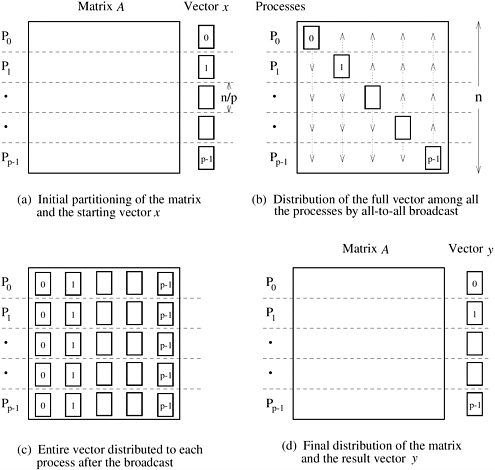 Consider a logical two-dimensional mesh of p processes in which each process owns an block of the matrix. The vector is distributed in portions of elements in the last process-column only. Figure 2 also illustrates the initial data-mapping and the various communication steps for this case. 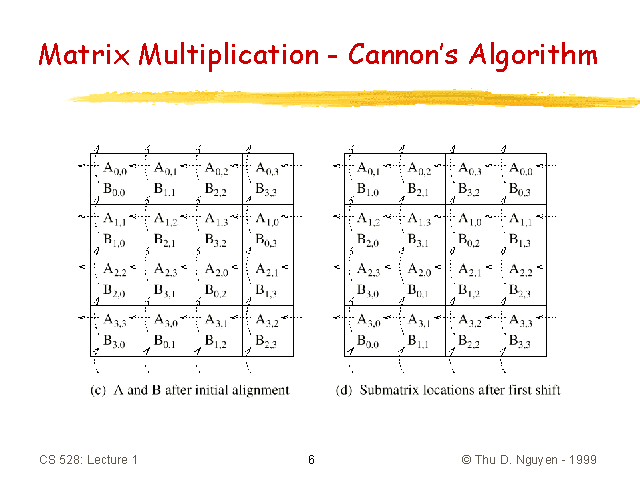 The entire vector must be distributed on each row of processes before the multiplication can be performed. First, the vector is aligned along the main diagonal. For this, each process in the rightmost column sends its vector elements to the diagonal process in its row. Then a columnwise one-to-all broadcast of these elements takes place. Each process then performs n2/p multiplications and locally adds the sets of products. At the end of this step, as shown in Figure 2(c), each process has partial sums that must be accumulated along each row to obtain the result vector. 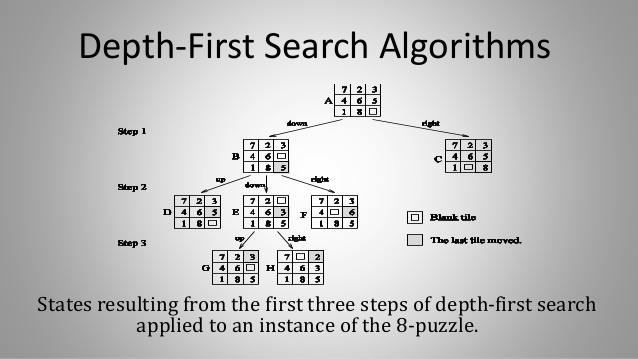 Hence, the last step of the algorithm is an all-to-one reduction of the values in each row, with the rightmost process of the row as the destination. ii) The power dissipation and related thermal. i) In computer science, distributed memory refers to a multiprocessor computer system in which each processor has its own private memory. Computational tasks can only operate on local data, and if remote data is required, the computational task must communicate with one or more remote processors. 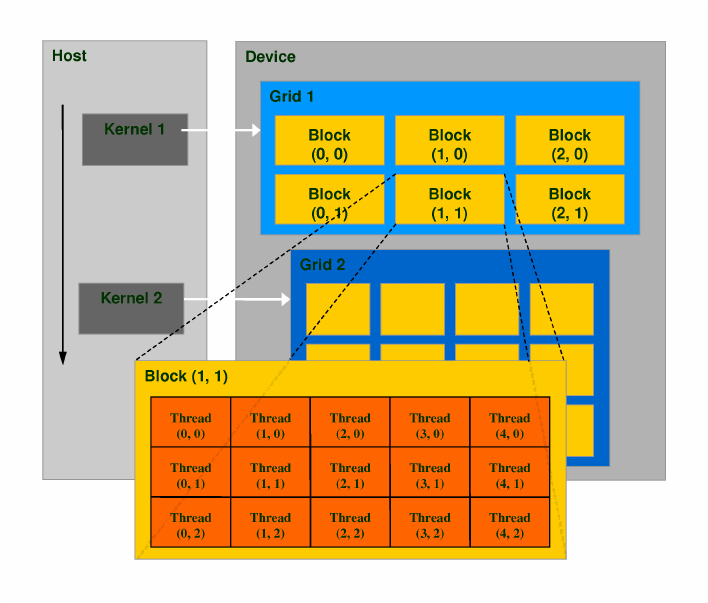 ii) In contrast, a shared memory multiprocessor offers a single memory space used by all processors. Processors do not have to be aware where data resides, except that there may be performance penalties, and that race conditions are to be avoided.In a distributed memory system there is typically a processor, a memory, and some form of interconnection that allows programs on each processor to interact with each other. iii) The interconnect can be organised with point to point links or separate hardware can provide a switching network. 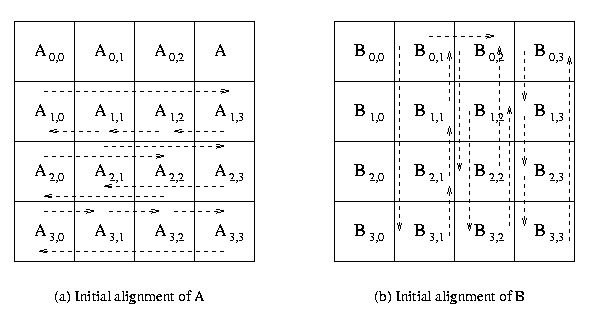 The network topology is a key factor in determining how the multiprocessor machine scales. The links between nodes can be implemented using some standard network protocol (for example Ethernet), using bespoke network links (used in for example the Transputer), or using dual-ported memories. i) Optical or photonic computing uses photons produced by lasers or diodes for computation. For decades, photons have promised to allow a higher bandwidth than the electrons used in conventional computers. ii) Most research projects focus on replacing current computer components with optical equivalents, resulting in an optical digital computer system processing binary data. This approach appears to offer the best short-term prospects for commercial optical computing, since optical components could be integrated into traditional computers to produce an optical-electronic hybrid. However, opto electronic devices lose 30% of their energy converting electronic energy into photons and back; this conversion also slows the transmission of messages. All-optical computers eliminate the need for optical-electrical-optical (OEO) conversions, thus lessening the need for electrical power. i) Green computing is the environmentally responsible and eco-friendly use of computers and their resources. In broader terms, it is also defined as the study of designing, manufacturing/engineering, using and disposing of computing devices in a way that reduces their environmental impact. ii) Green computing, green ICT as per International Federation of Global & Green ICT “IFGICT”, green IT, or ICT sustainability, is the study and practice of environmentally sustainable computing or IT. iii) The goals of green computing are similar to green chemistry: reduce the use of hazardous materials, maximize energy efficiency during the product’s lifetime, the recyclability or biodegradability of defunct products and factory waste. Green computing is important for all classes of systems, ranging from handheld systems to large-scale data centers. iv) Many corporate IT departments have green computing initiatives to reduce the environmental effect of their IT operations. iv) This enumeration mainly depends on the tyoe on interconnection network. i) In case of sequential algorimths, all the data that is to be compared is present on only one process, whereas in case of parallel algorithms, data is distributed to n number of processes. Hence there can be two cases in case of how comparisons are performed.